"Our goal is to take all of these innovative concepts and combine them into therapeutic approaches that can be less invasive and more advantageous for our patients while maintaining the benefits of surgery – very specific and precise manipulation of particular circuits in the brain, leaving the rest of the healthy brain alone." Weill Cornell Medicine physicians are using new, minimally invasive, stereotactic techniques for the treatment of functional disorders. One such technology is high-intensity focused ultrasound (HIFU), approved for use by the FDA in July 2016. Our physicians were the first in New York to use focused ultrasound to relieve a patient’s essential tremor. The procedure is part of a new clinical trial testing the use of this technology to eliminate the source of tremors in a completely noninvasive way. Focused ultrasound has the potential to transform treatment by gaining access deep within the brain without harming healthy tissue. It also enables surgeons to ablate targeted tissue without exposing the brain to the effects of ionizing radiation. 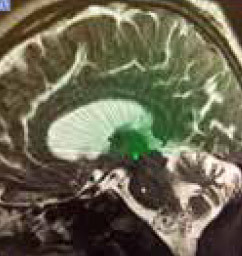 An MRI shows the targeted area of the brain ablated by focused ultrasound. Performed while the patient is awake, HIFU involves no anesthesia, no incisions in the scalp, and no burr holes through the skull or insertion of electrodes. The patient wears a fitted helmet that holds 1,000 transducers, or beams of ultrasound waves. While individually the waves don’t have enough energy to damage brain tissue, when they are combined and directed at the same target from different directions, they create a high amount of energy that can destroy a small area of the brain. During focused ultrasound therapy, target cells in the thalamus are visualized in real time using MR imaging. The highly precise treatment starts on low energy and gradually builds intensity, using focused beams of acoustic energy to heat and destroy target lesions as small as one to two millimeters, thereby eliminating or greatly diminishing the tremors. Saggital view of a slice of the focused ultrasound beam plan shows some of the nearly 1,000 beams directed at the source of the tremors. “Our goal is to take all of these innovative concepts and combine them into therapeutic approaches that can be less invasive and more advantageous for our patients while maintaining the benefits of surgery – very specific and precise manipulation of particular circuits in the brain, leaving the rest of the healthy brain alone,” said Dr. Michael Kaplitt, who is an associate professor of neuroscience and neurological surgery at Weill Cornell Medicine and a neurosurgeon at NewYork-Presbyterian/Weill Cornell Medical Center. Dr. Michael Kaplitt was the first physician in New York to use HIFU treatment in the brain as part of the clinical trial in July 2016. During that procedure, he watched a trial participant’s tremors disappear in a matter of minutes. 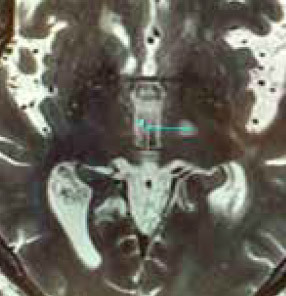 Currently, the main option for essential tremor patients who do not respond well to medical therapy is deep brain stimulation (DBS), which involves placement of an electrode into the same area of the brain targeted by HIFU and implantation of a battery under the skin in the chest to power the therapeutic electrical impulses. DBS, which has been offered by Dr. Kaplitt and his team for movement disorders for over 15 years, remains a viable option for patients who may not be candidates for HIFU therapy. Trial participants who have undergone the HIFU treatment in other parts of the country have seen significant improvements in tremor, with some having return of function to normal, according to the FDA and a study published Aug. 25, 2016 in the New England Journal of Medicine. In that study, about a third of subjects experienced a loss of control of body movements following the procedure (ataxia) as well as numbness — adverse events that persisted at 12 months for 9 percent and 14 percent of patients, respectively. Weakness occurred in a small percentage of subjects, persisting rarely. One subject had persistent finger pain a year after the procedure. Essential tremor is a surprisingly common problem, affecting many more patients than Parkinson’s disease and other better known neurological conditions. Alexandra Lebenthal knows this very well. At age three, she developed tremors when she moved, but the condition was not unfamiliar to her. Her father suffered from the same problem as he ran the financial services company started by his parents. As her professional standing grew to place her at the head of her family company, her tremors continued to worsen, creating difficulties with her increasingly public life. People often wondered whether she had Parkinson’s disease or some other disorder. Medication was of little help, so she eventually met with Dr. Michael Kaplitt to discuss deep brain stimulation. She felt that this was not right for her either, so she waited. When she got the opportunity to be one of the first in New York to undergo focused ultrasound, a new method requiring no surgery or devices, she jumped at the chance. The three-hour procedure was led by Dr. Kaplitt and performed entirely in the MRI machine. Physicians would periodically ask Alexandra to draw a straight line or a spiral to gauge how well the therapy was working. And her husband was able to visit her during the procedure, something not possible with traditional surgery. She was awake the entire time, and as the key spot in the brain was identified and targeted, she noticed a steady improvement in her tremor until it was gone. Immediately she was able to drink from a cup without difficulty for the first time in many years. Alexandra remains amazed at the technological advances that allowed her to overcome essential tremor without medicine or open surgery, and she has been enthusiastically sharing her story to help educate others about this new option.